Join us at this dynamic and interactive event which brings together Urban Planning students, alumni, faculty, and professionals from the Los Angeles area. Our graduating Master’s students will showcase their capstone projects as we eat, drink, and mingle with new and old friends. We look forward to seeing you!!! From the 405 Freeway: Exit on Sunset Blvd. Proceed EAST on Sunset Blvd. and enter the campus by turning RIGHT onto Bellagio Drive. Proceed to the stop sign at the top of the hill. Turn LEFT at the stop sign onto De Neve Drive. Proceed 3/10 of a mile down the hill to the SV (Sunset Village) parking structure. The structure will be on your right. Turn RIGHT into the parking structure. 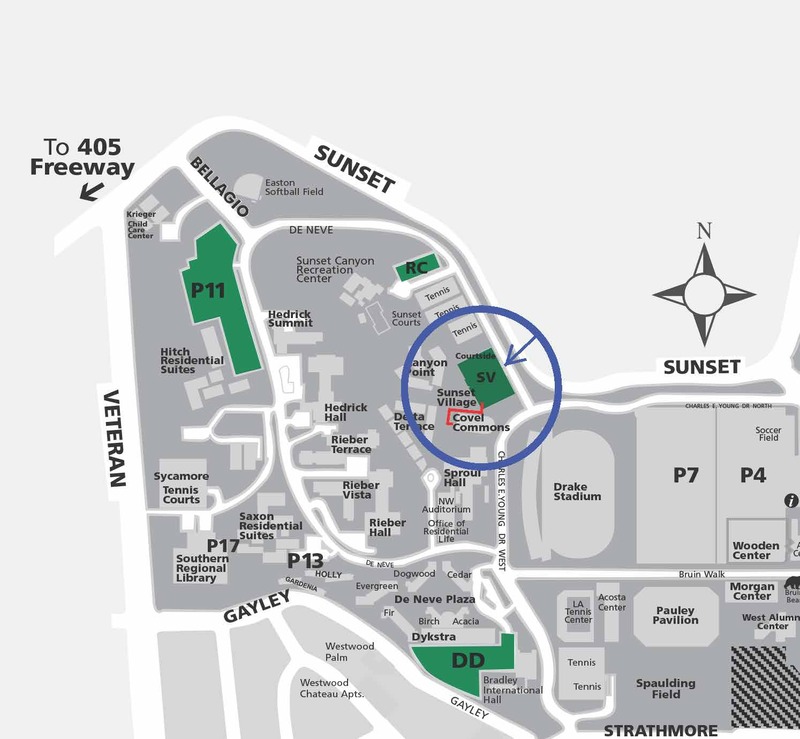 Purchase a parking permit from an attendant OR one from the “Pay-by-Space” kiosks located on the P1 level. Park in any unmarked space. Place the permit on your car dashboard so it is visible through the driver’s side of the windshield. Take the elevator or the stairs (located in the southwest corner of the parking garage) to the Lobby Level (L). Upon exiting the elevator, Covel Commons building will be in front of you. Proceed straight ahead (about 10 feet) then turn RIGHT and walk along the perimeter of the Covel Commons building, making a LEFT at the corner, then LEFT into the main doors entering the main lobby. Proceed to the 3rd Floor for the Grand Horizon Room. UCLA Urban Planning CCC directional signs will be places along the route.